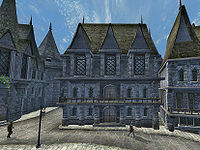 Purchase Rosethorn Hall, a large manor house in Skingrad. You need to have a disposition with him of at least 70 and at least 15 fame points to convince him to sell you the manor. The house itself costs 25,000 septims, but you will need to furnish it completely (fifteen upgrades) to complete the quest. Find him yourself. He is usually either in the County Hall at Castle Skingrad or at the West Weald Inn, but may be found wandering elsewhere in Skingrad. Speaking to the Count's other staff at the County Hall can initiate this quest in your journal, providing a quest marker pointing to Shum gro-Yarug. You will need to increase Shum gro-Yarug's disposition up to 70 as well as obtaining 15 Fame points before he will agree to sell you the house. Pay him the asking price of 25,000 septims, and the house is yours. To complete the quest, it will be required to completely furnish it. Colovian Traders (across the road from the Mages Guild hall and All Things Alchemical) sells all of the fifteen upgrades, for a base price of 1600 gold. Vandorallen Trebatius was the previous owner of Rosethorn Hall. Although he will be evicted when you purchase the house, he will not complain about the eviction—but will dislike you more (-15 disposition). Shum gro-Yarug is a candidate for the "sudden NPC death" because he tends to fall from the bridge to the castle. If he is dead, his quest marker will uselessly cycle between Skingrad and Castle Skingrad. It is advised to buy the house early on in the game, to be safe. This issue has been addressed by version 3.4.0 of the Unofficial Oblivion Patch; Shum was made essential and the road pathing over the bridge was corrected to solve these issues. You can use the console command player.placeatme 00028FB6 to respawn him at your location; however, you may have to raise this respawned Orc's disposition (again) with Speechcraft. For one free upgrade to Rosethorn Hall, sneak into the Surilie Brothers house, and sitting on the table will be a letter that gives you the Upper Wall Hangings upgrade. It seems that the original price of the house was 10,000 septims, given that Shum gro-Yarug mentions that he "wouldn't dream of paying 10,000 gold for your blood. But that is the price for that house". 5 I was told that I need to speak with Shum gro-Yarug to buy a house in Skingrad. 10 I just bought a house in Skingrad. It's just inside the main gate, next to the bridge that leads to the Chapel. 20 Now that I've arrived at my new house in Skingrad, I may want to head over to Gunder at Colovian Traders to secure some furnishings for it. 30 Finishes quest I've now bought everything Gunder has for my house in Skingrad. It is possible to use the console to advance through the quest by entering setstage HouseSkingrad stage, where stage is the number of the stage you wish to complete. It is not possible to un-complete (i.e. go back) quest stages. See SetStage for more information.